I followed the instructions I found on-line for how to make the ramen bun: cook the noodles, mix with a beaten egg, mold into shape, chill in the fridge, and then pan fry. 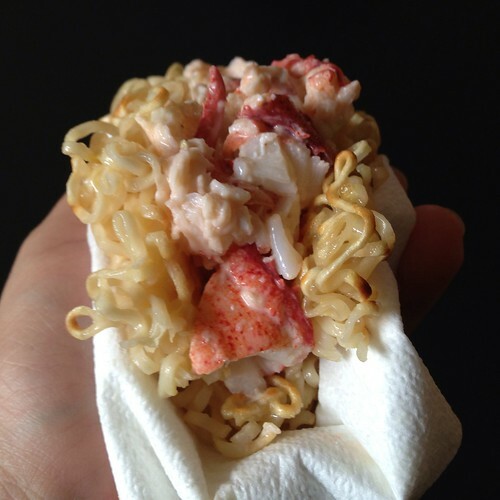 Since I wanted the bun for a lobster roll, I molded the noodles into a square shape and then folded it in half after frying it. For the lobster salad, I mixed the chopped lobster meat with some Kewpie (Japanese-style) mayonnaise and sprinkled in a little bit of the ramen seasoning and sesame oil to taste. If I had had scallions, I would have chopped some up and added them too, just continue on with the Asian theme. Bring a small pot of water to boil and cook the ramen noodles until they are cooked but still firm. Drain and rinse with cold water. Mix the noodles with the beaten egg. Divide the noodles between two 6" square containers. Top with plastic wrap nest one of the containers in the other. Nest another square container in the top container and weigh down with something heavy. Chill in the refrigerator for at least 15 minutes. 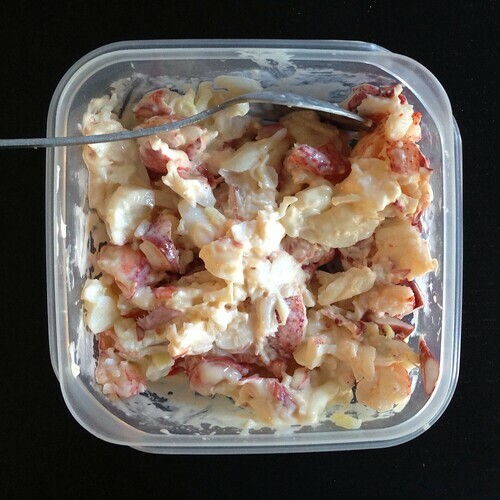 In the meantime, make the lobster salad by mixing the chopped lobster meat with just enough mayonnaise to bind the meat together. Sprinkle in some of the ramen seasoning to taste. Add the sesame oil and chopped scallions, if using, and mix. Chill until ready to use. Heat a couple tablespoons of oil in a non-stick frying pan. Carefully release the ramen buns into the pan and cook for a few minutes on each side until nicely browned. Remove from the pan and immediately fold in half. 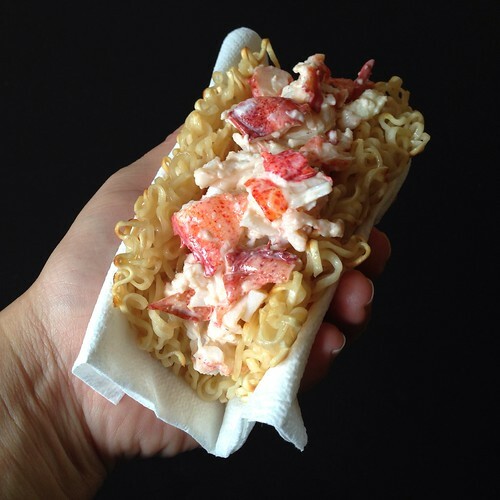 Once the ramen buns are cool enough to handle, fill each with half the lobster salad and enjoy!